The color of your urine can be considered one of the barometers in determining your overall physical condition. For example, a darker urine color can indicate that you are dehydrated. Urine color also tends to be darker (usually dark yellow) after a strenuous exercise. However, did you know that urine color can also indicate a life-threating condition? In fact, an ordinary yellow color of urine is sometimes a sign of hidden cancer and kidney disease! In this article, we'll let you know how urine shows hidden signs of cancers and kidney diseases and what the different urine colors may mean. You may think that either reddish or brownish colors of urine are signs of serious health problems. However, even a normal yellow color can be a dangerous indication, too. 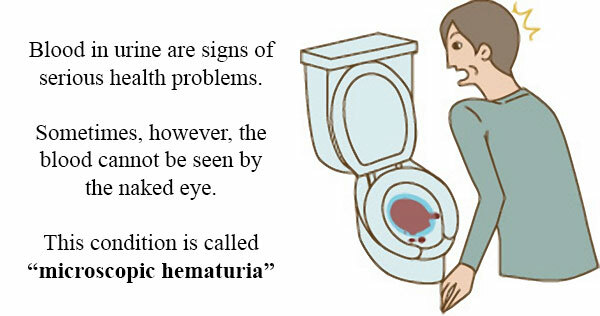 Hematuria is the medical term for having blood (red blood cells) in the urine. However, not all cases of hematuria can be seen by the naked eye. This type of hematuria is medically known as "microscopic hematuria". 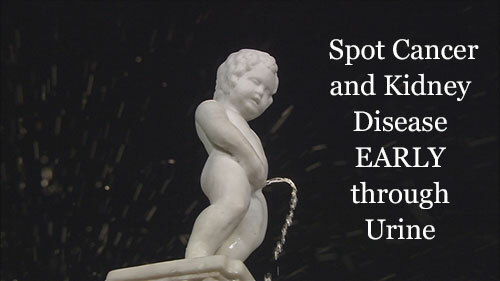 As its name implies, the urine contains small amounts of blood that can only be seen with a microscope. More than half of cases of microscopic hematuria only happen "by chance". Meaning to say, it can happen because of high blood pressure, aging, or physiological reasons in the case of women. Microscopic hematuria can even occur due to some medications and after a strenuous exercise. However, a small amount of blood can still mix in the urine due to a serious illness, so you can never discount the risk of "cancer" and "kidney disease". So, how can you tell if you have the dangerous type of hematuria? The most important thing that you should do first is to undergo re-examination once you get your occult blood results in a urine test. It is possible to evaluate kidney problems based on the changes in the shape of red blood cells that are mixed in your urine. A nephrologist will examine your urine occult blood under a microscope with cell shape as criteria. The same thing can be done with bladder cancer by a urologist. If cancer cells are found through a microscope by checking the blood in urine, then the possibility of cancer should be considered. In the above statements, "re-examination" only means having a "thorough or detailed examination". It is recommended that you ask your doctor about receiving proper and thorough examination, preferably a nephrologist or urologist. Below are some of the conditions that need to be followed before taking a urine test to ensure accurate results. Excessive intake of vitamin C can interfere with the occult blood test when applied to the test paper. Stop taking vitamins the day before the urine test. Doing exercise like jogging can cause some red blood cells to break apart and spill into the blood. It will then make their way into the urine and may be mistakenly diagnosed as "hematuria". To prevent this, it is recommended that you take the urine test first thing in the morning when your body is still in a state of rest. In some cases, taking too much water just before the urine test can result to a urine that is too pale and the test may find no issues at all. It is recommended that you drink only small amount of water prior to taking the test. The dark yellow color of urine may be caused by the presence of a substance called bilirubin. Bilirubin is an orange-yellow pigment formed in the liver by the breakdown of red blood cells. Bilirubin in your urine can be an indication of liver disease. A high blood sugar can cause excessive urine production and may result to pale urine. More frequent urination with pale urine can also be an indication of a kidney problem. Dark green urine may indicate a urinary tract infection caused by the bacteria Pseudomonas aeruginosa. Luckily, this can be treated with antibiotics. Eating beetroots (round red root vegetable) can turn your urine red. Riboflavin (vitamin B2) makes your urine fluorescent-yellow. Rhubarb can turn your urine pinkish or brownish. There is a thing called "urine therapy" that is also used to naturally heal acne. The ancient Romans used urine as laundry detergent. In ancient history, urine is used to tan leather. 1. "Urinating Frequently at Night (Nocturia)? Here's What You Should Do"